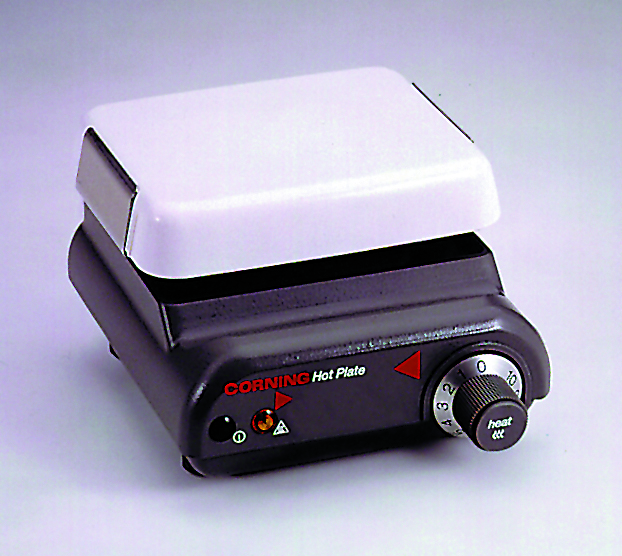 Now in a space saving, lower profile, Corning’s unique scratch, corrosion and chemical resistant Pyroceram® white glass ceramic topped hotplate offers more convenience and performance than ever before — convenience like a housing that slopes down and out from the top to conduct spills away from internal electronics and digital controls right out in front for easy handling. There’s even a mount for a ring stand support built into the back of the housing. 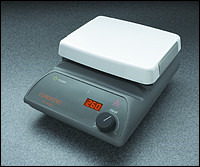 With Corning’s Pyroceram top you get smooth, even heating without hot or cold spots (up to 550°C) — and you can wipe it clean with a damp cloth. Digital LED temperature display is adjustable in 5°C increments and blinks until set temperature is reached. Bright LED HOT TOP icon lights up when top plate is over 60°C, even when heat control is turned off. Separate temperature sensor provides power cutoff if unit overheats. Cat. No. 565-300-00 is not digital. 120 volt, 50/60 Hz. Warranty 2 years. CSA Approved. Optional external temperature controller (Cat. No. 565-300-06) assures temperature accuracy of the liquid as opposed to the temperature of the plate. It truly controls temperature inside the vessel and eliminates the need to closely monitor liquid temperature. It will also shut off unit when controller is not in liquid. For use with digital models only.